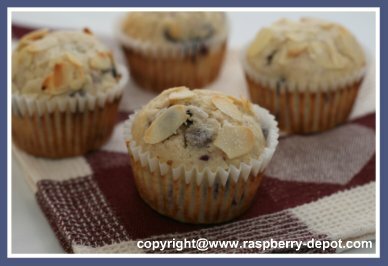 This Black Raspberry Muffin Recipe is simple to make and scrumptious in flavour. If you are lucky to have Black Raspberries on hand, this is a great recipe to make. Of course, you can also use this recipe with red raspberries, or any other variety of raspberries. Note - If you are using frozen raspberries, thaw them first in a strainer over a bowl, and discard the excess liquid. In a large bowl combine the flour, baking powder, salt and the sugar. Crush 1/2 cup of the sliced almonds, and add to the flour mixture. Gently stir in the black raspberries. In another bowl, lightly beat the eggs, add the buttermilk, oil, and the almond extract. Make a well in the center of the dry ingredients, and pour in the egg mixture, just until combined. Do not over mix. Spoon the batter into greased muffin cups, or paper-lined muffin cups. Sprinkle the slice almonds and raw sugar over the tops (optional). Bake at 400° F for about 18 - 20 minutes, or until golden brown and firm to the touch.